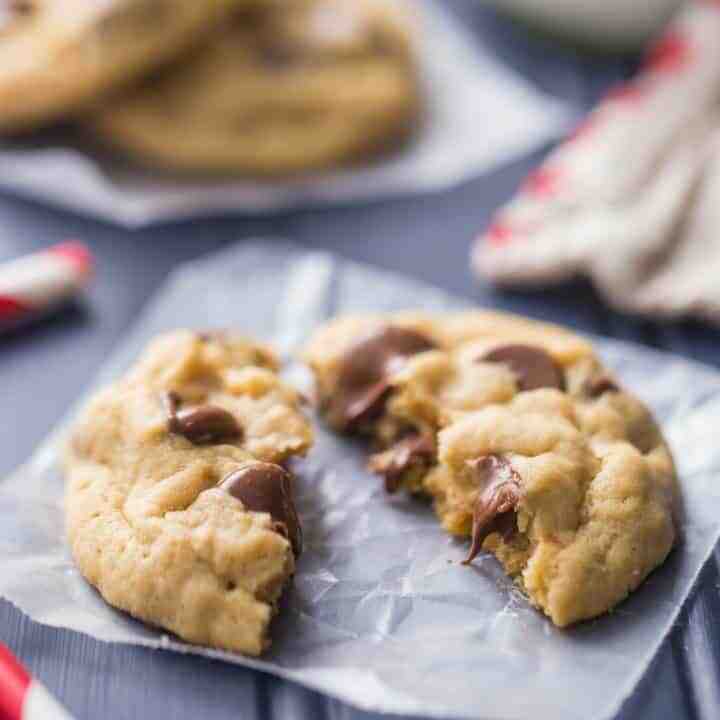 These soft peanut butter chocolate chip cookies taste like a Reese’s cup, in cookie form! So soft & tender, with tons of peanut butter and chocolate flavor. Today I am bringing you the best cookie recipe I have made in a long time! These soft peanut butter chocolate chip cookies are my new favorite. In fact, I think they are a little too dangerous for me to keep around. I keep finding myself going back to the kitchen for another one, over and over again throughout the day! Baking cookies is one of my favorite things to do, because you get a warm, comforting treat with a minimal investment of time. Some of my most popular cookie recipes include these Soft Cut-Out Sugar Cookies, these Brookie Cookies, and these Cherry Cheesecake Thumbprint Cookies. And now I’m adding these unbelievably soft and peanut-butter-y chocolate chip cookies to the list. They are just bursting with peanut butter flavor, and are loaded with melty chocolate. Such a comforting treat for after school or for a decadent dessert. Get your glass of milk ready! To make this incredibly indulgent treat, start by creaming the peanut butter, butter, and sugars together in a big mixing bowl with an electric mixer. Cream it for a full 5 minutes on medium-high speed, so that it becomes really pale and fluffy. Next, add your egg and egg yolk. When the eggs are fully incorporated, add the flour, cornstarch, baking soda, and salt. I love to add cornstarch to all my cookie recipes because it helps keep them soft and tender. Please be sure to use cornstarch, which is white, powdery, and flavorless, as opposed to cornmeal, which is yellow, grainy, and tastes like, well, corn. For the salt, I personally like a little more salt in my peanut butter cookies. I feel like it brings out the peanut butter flavor more. But if you are not a fan, feel free to cut back a little on the amount listed below. Once your dough has just barely come together, fold in the chips and start scooping! For the cookies you see here, I used regular old Jif peanut butter. It’s not unsweetened peanut butter or natural peanut butter. You can use crunchy or creamy peanut butter, but I prefer creamy. If you use an all-natural peanut butter here, you might not get quite the same result because sometimes those types of products can be a little more oily. I am partial to milk chocolate chips in this recipe, because I think the milder flavor really allows the peanut butter to shine. These cookies taste a lot like Reese’s peanut butter cups, but in cookie form! If you don’t have or don’t want to use milk chocolate chips, you can use semi-sweet or bittersweet or whatever kind of chips you have on hand! One of the biggest factors in baking soft cookies is the bake time. It’s so critical! Please, please don’t over bake your cookies. They should actually come out of the oven when they look just a little bit under-done. This is because of carry-over cooking (the idea that things will continue to cook even after they’ve been removed from the heat). The residual heat of the baking sheet and of the cookies themselves will continue to cook them, even after they’re taken out of the oven. Check your cookies after 8 minutes. If they look like they’re just barely beginning to turn golden on the bottoms, take them out. They will probably look puffy and may even be glistening with moisture a little bit towards the center. That’s ok! They will firm up as they cool and they will also sink down a little. 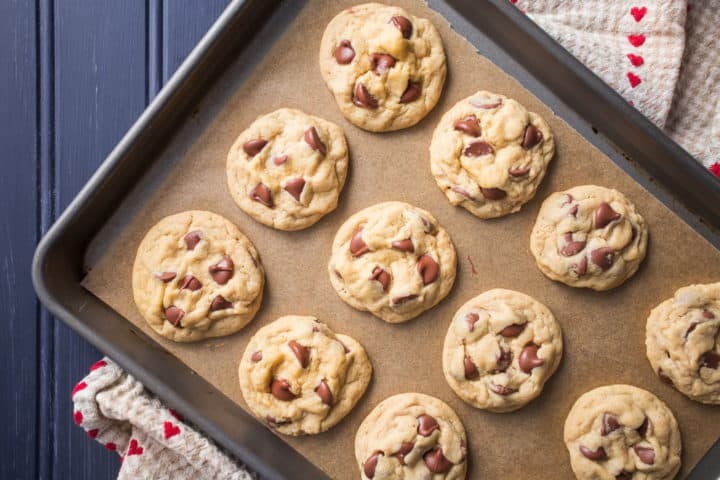 For lots more great info on how to bake soft cookies that truly stay that way, sign up for my free email series “5 Secrets to Baking Impossibly Soft Cookies.” <--There's tons of really great info here! You don’t need to do anything special to these cookies to make them stay soft. They come out of the oven really soft, gooey, and tender, and they will STAY soft for days after they’ve cooled. Something about the ratio of ingredients in this recipe really works. You won’t believe it! These cookies will keep at room temperature, in a zip-top bag or airtight container, for around 5 to 7 days. Or, they can be frozen. They will stay good in the freezer for 2 to 3 months. If you want to make the dough ahead, just cut back on the flour a bit, as it will become drier as it sits. If you find that your dough has become too dry and crumbly after sitting, you can moisten it back up by working in a few tablespoons of cream. Sometimes I really like to make cookie dough and freeze it. To do this, scoop the dough into 1.5-tablespoon balls and place on a baking sheet in the freezer. Once they’re frozen solid, transfer them to a zip-top bag and keep them in the freezer for 2 to 3 months. 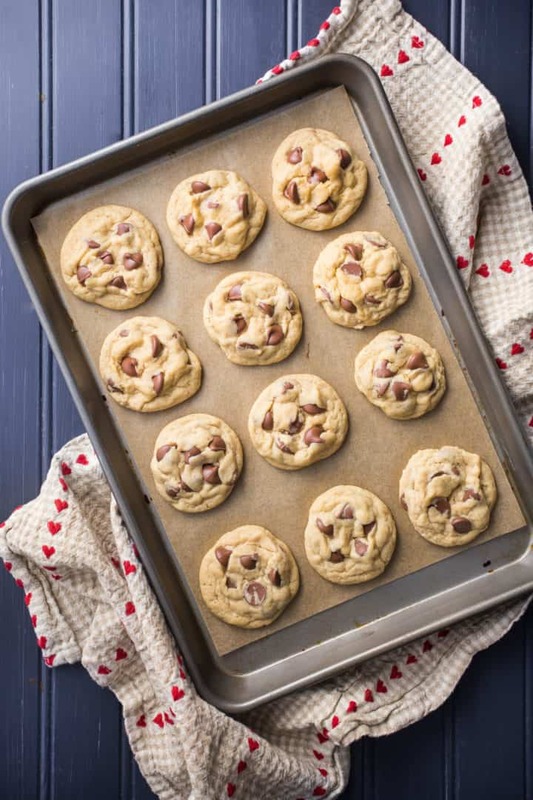 Whenever the craving for a freshly baked cookie hits, just place the frozen dough balls on a parchment-lined baking sheet and bake. 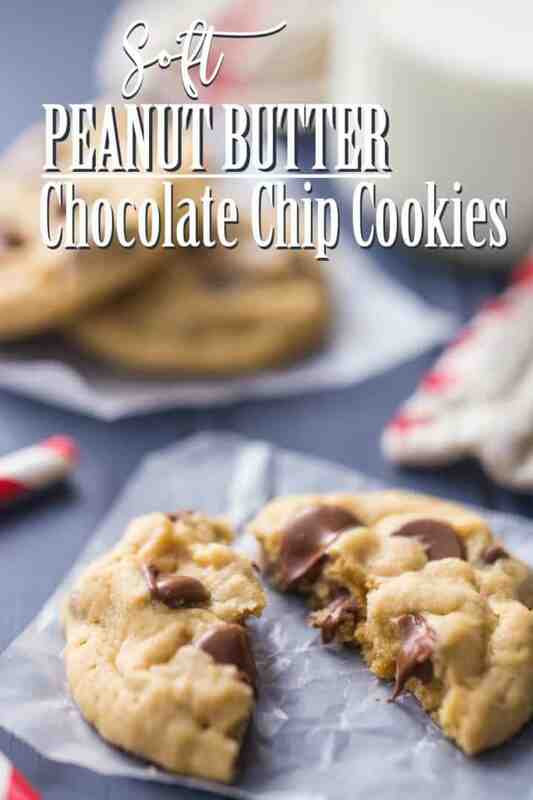 You won’t believe how tasty these peanut butter chocolate chip cookies are! They’re soft, and so tender they practically melt in your mouth, with tons of rich chocolate in every bite. So, so good! These soft peanut butter chocolate chip cookies taste like a Reese's cup, in cookie form! So soft & tender, with tons of peanut butter and chocolate flavor. Preheat the oven to 375 degrees F, and line baking sheets with parchment paper. Place the peanut butter, butter, brown sugar, and sugar in a large mixing bowl and cream on medium-high speed for 5 full minutes (the mixture should look very pale and fluffy). Beat in the egg and the egg yolk, until smooth. Add the flour, cornstarch, baking soda, and salt, mixing in on low speed until just barely combined. 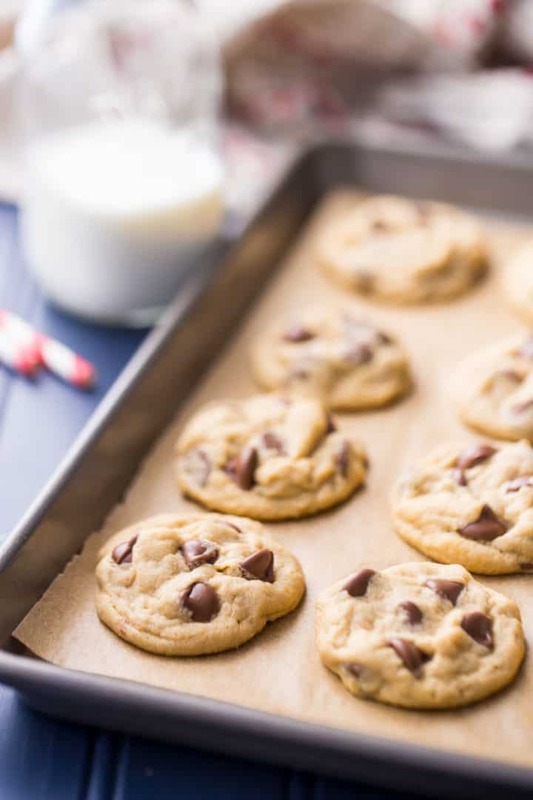 Fold in the chocolate chips, and scoop 1.5-tablespoon balls of dough onto the prepared baking sheets. Bake for 7 to 9 minutes, or until just barely beginning to turn golden on the bottoms. Cool for 10 minutes on the baking sheet, and serve. And if you're into soft cookies, be sure to sign up for my free email series "5 Secrets to Baking Impossibly Soft Cookies!" Do you use the Ghirardelli brand of milk chocolate chips? Don’t ever really use milk chocolate chips, so just wondering if that’s your favorite. Thank you! These cookies look delicious. Yes that’s right! That is exactly what I used. Hope you enjoy the cookies! My perfect combination of things in a cookie- chocolate and peanut butter! Yum! I made these cookies. First, they did not flatten out much. They were still rounded in the middle. Second, they were crumbly. They did appear done and they just melted in your mouth. The taste was incredible. I followed your recipe explicitly so i don’t know what happened. Any insight would be very helpful. Hey Phil! So sorry to hear your cookies did not flatten out enough. I’ve noticed this can happen when the dough is overworked. Once the flour goes in, if you continue to mix for more than a few seconds, it can develop the glutens to much and the cookie dough can “tense up.” I would recommend turning off the mixer when there are still a few streaks of flour left, and then just fold the dough for a few strokes by hand. Another thing that could cause this issue is too much flour. 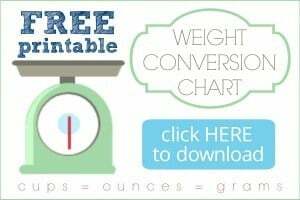 Check out this article: https://bakingamoment.com/how-to-measure-ingredients-for-baking/, and make sure you aren’t packing the flour into the measuring cup. If all else fails, you can up the leavening just a little bit (I’d say maybe an additional 1/8 to 1/4 teaspoon), and that will cause your cookies to spread a little more. Hope these tips are helpful! Thanks for the quick reply. I measure my dry ingredients by weight. I have your conversion chart taped up in the cabinet over my mixer. I have pretty bad arthritis in my hands so I tend to mix as much as possible in my mixer so over mixing is a definite possibility. the cookies tasted great so I will definitely try again. thanks. No problem! Hope you have better luck next time. Is the measurement for cornstarch correct 1/4 cup?